The class I tried was the Bard (played up to level 12). It's a healing class with quite some offensive powers. Of course, adding those offensive powers can only be done at the cost of the healing power. Much like the Chanter class, the number of healing skills is limited. Where the Chanter is a short ranged melee class, the Bard is a ranged magic user class. This means that the bard uses robe (light in Aion) armor and is quite vulnerable for damage. This implies that it's more a (small) party class than a solo playing class. And that's exactly where the problem lies. Western players are so different from Korean (Eastern in general) players. 'We' like to play solo. Though I'd love to play MMOs in a party (which is where they were intended for), finding one is a problem most of the times. After all, 'we' play solo and most other players just 'grind' their way through the content and pop potions like they're candy. An other problem I have with Aion is the content. There's totally no change in low-level content. The areas as they were at release are still identical and the same goes for the quests. Basically, having played it once, playing it again becomes extremely boring for me. So I figured to look on eBay for the old European Aion 2.0 (Assult on Balaurea) expansion, which I found for �6.70. I only wanted that box for the inventory panda it'd give me, but that was a no-go. When I got the key from the eBay trader after 4 days, the NCWest account system told me that the key was expired. Now that's odd, since the box that I have here does not show an expiration date. That code you provied is an expired European Aion serial code. As the Aion Europe service has gone free to play and has been transferred to Gameforge?�, any retail serial codes remaining in circulation have been disabled. All of our authorized retailers have previously been notified of this change and have been instructed to pull the game off the shelves. If you purchased an Aion Europe product from one of our authorized retailers, you may wish to consider contacting them about a refund for the purchase (or equivalent product replacement). Please keep in mind, though, that such a decision will be made at the discretion of the retailer in question as they will have their own policies for such matters. Continue on EU servers or restart on US servers? With my account transferred to GameForge, including the Collector's Edition I had as compensation for my Tabula Rasa account, the Assult on Balaurea expansion (including an inventory pet), 2 pets I bought at from the cash shop and a but load of goodies, including 5 months of veteran goodies. Not to mention, my account is flagged as veteran account, making it close to a life-time subscription. Now that I'm willing to pick Aion up again, I'm in doubt weather to play with GameForge or with NCWest, where both publishers have good and bad points. First off, GameForge, also known as Frogster... Well, I rest my case there... We European players know their reputation and truth to be told, their actual service in general is even worse than their reputation Only for that reason I'd hop to the NCWest servers immediately. With the RMT yellers being THAT active, it'll mean that bots are extremely active as well. And then we're back to the Lineage II situation where I have to fight to claim my spot to level, but this time I can't kill every player I want to (one of the bad things of fixed-faction games). After yesterday's experience, I took a good look at the Aion forum to see what server is real active. And from the looks of it, the old server (Spatalos) is all but active. I mean, in the server section there are only 53 threads with a total of 458 posts. Compare this to the newest server (Nexus), where the total of threads hits 126 with a total of 913 posts total. Yeah, clearly the old servers (Spatalos and Perento, the latter is even less active on the forum) have had their best days I think. Then the server I did pick: Anuhart. I'm not sure how recent this one is, but I don't recall it to be a former NCSoft server. This server is real active on the forums. The total of threads are 207 with a bit over 4.000 posts. Now that does seem like an active server. Browsing this server's forum quickly did indeed show a rather active server. But that's on the forum. How are things on the actual server..? So I made an Elyos character there (by now she's a Chanter). And first thing I come across is a RMT yeller. Now that's a good (and rather annoying) sign already. RMT seller would not bother to start 'advertising' on the spot where new players enter the game if there won't be new players, right? I'm not sure what it is with Aion. Ever since the release it's had rather odd community issues. As I've written before, there is a design flaw in Aion that forced you to party, but when you start later, there's no one to party with, and higher level players don't care to help you out. I thought it was a good thing that the design flaw was eliminated but I think I was wrong. 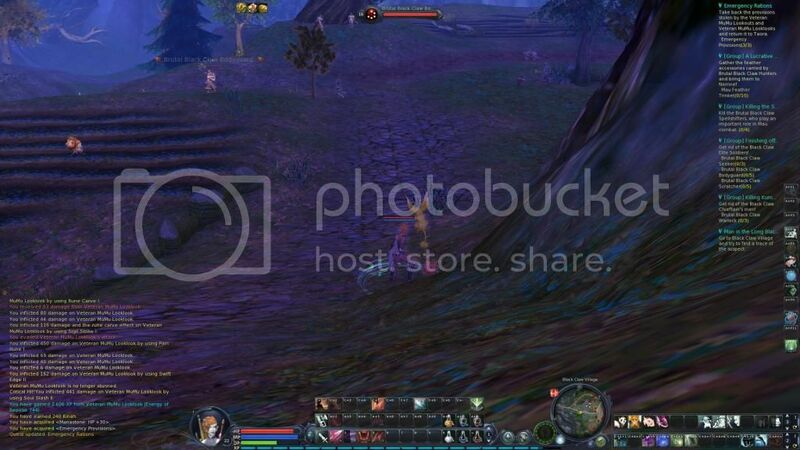 The general community in Aion are just selfish retards (not all though). Ever since I returned lately, the epeen in /3 LFG has been off the scale, more than the epeen shown by kids in other MMORPG's I've played. These are generally the 'higher level' players who brag on how good they are and stuff like that. Same goes for parties. Unless you're on the mentor/mentee daily quest, no one bothers to party with a lower level player. Not even other lower level players to speed up PvE questing. And then there was today, the major epeen showoff. I was killed by a high level Ely (yeah I really think those kids come off by killing 20 levels then they are). Though I have no problem with that,, I do report it in /3 LFG. But today's reaction showed how bad the 'community' is: "Level up and kill him yourself". WTF..? No support and showing your epeen on 'how good' you are? One of the BIG problems with Free2Play MMORPG's are the Real Money Traders (RMT). The main reason Free2Play MMORPG's are invested with them is that, well... the game is FREE. 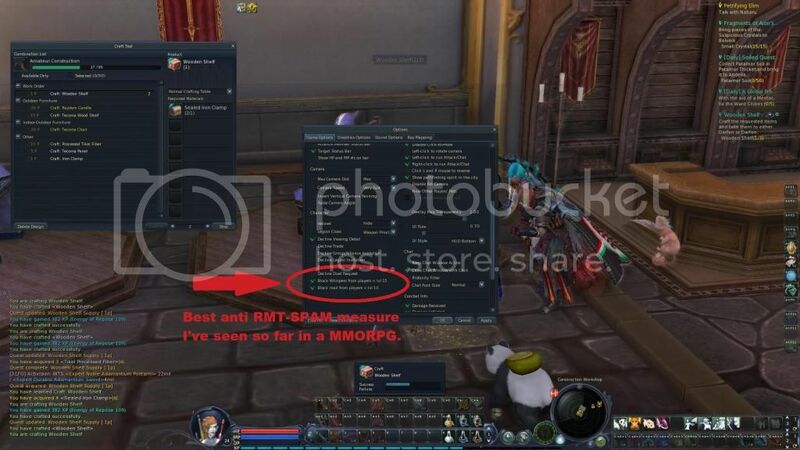 And because of that, the RMT's make bots to level to the minimum level where they can advertise their illegal activities (keep in mind that EVERY sale of in-game items for real world currency is not allowed in almost every MMORPG). Back to the /shout pollution in the capitols. We can't report players in cities for botting (still don't know why this is prohibited...). But GameForge did come up with something else for that. They made a Kinah report site for that, where you can upload a screenshot and name the 'player' advertising the RMT. What's that hovering around me constantly? Yes, that yellow bunny with that long tail and overly sized ears it can fly with... That's a Golden Nyanco. I bought it when Aion was still available as subscription only-game and it was hosted by NCSoft. This pet is not only looking cute and keeping me company. This pet is one with the special skill to warn when enemy players are around. I was wondering how he'd warn me when there would be enemy players around, and by now I have found out. You really can't miss it. He'll have a red ambulance light above him (not that obvious), but the sound that comes with it is enough to draw your attention! Today I headed out to Morheim, and that's a region where 'rifts' appear and enemy players can get to our side. And though I'm still around the Morheim Icy Fortress, there are always lame kids who think it's fun to kill players of 20 levels (if not more) below them. That happened today as well, and the Golden Nyaco saved me already 3 times in half an hour or so. Okay, the last time that assassin had a shot at me, but I was quick enough to flee to a guarded place. But that's not all that has been changed. Remember me ranting about the main flaw in Aion? It seemed that NCSoft did find this flaw as well and did take some good measures against it. Though it's still there in a much lesser form. Late last year I had an eMail that Aion would go Free2Play for European players, and that NCSoft would transfer ALL player data to the new publisher (GameForge) for all players who would participate (unlike when Lineage II wehnt Free2play and ould be hosted by Innova). When I heard this news I was semi-excited. I do live Aion as it stands (aside from the design flaw), but as with Lineage II going Free2Play, hordes of as-hole kiddy players swarm the servers, killing fun for a lot of other players. Though on the other hand, all these new players would somewhat eliminate the design flaw, since there'll always be enough players in the level range for the 'forced party areas'. But I thought to keep a look from the positive side of Aion going Free2Play and allowed NCSoft to transfer my game data to GameForge and I signed up for the beta program. A few minutes ago if finally happened. 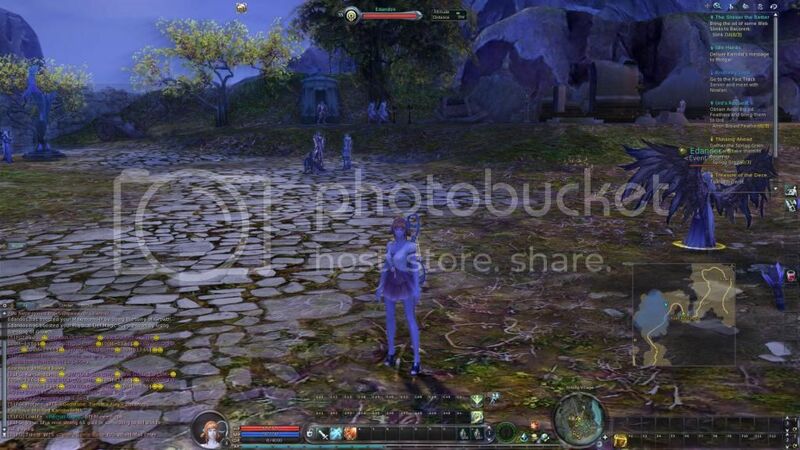 I was invited for the close beta test for Aion on the new servers. It tells me I do have a chance to win 'Veteran status' for a couple of weeks, but looking at the FAQ, I'll get one for sure since I subscribed in the past already. 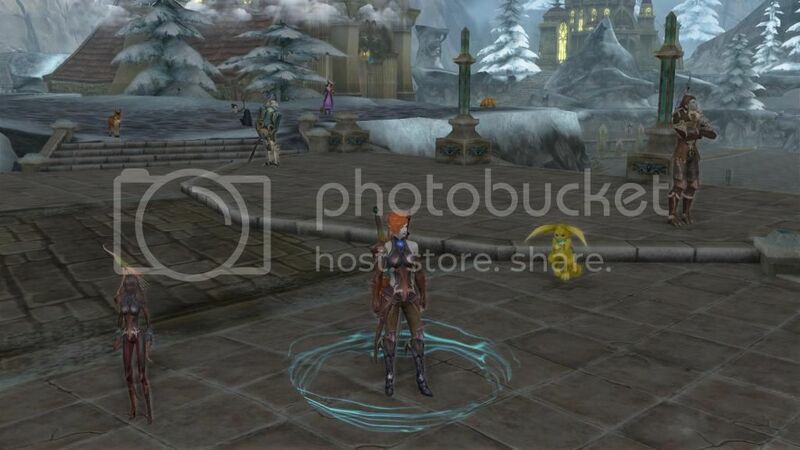 So instead of playing only Word of Warcraft from now on, I'll also play Aion for coming weeks in the beta! Yes, there's ganking all around the maps where high level players hop through rifts to lower level (enemy) area's to 'PvP' with the other side they encounter there. And most of the time this other side they find there are lowbee players with at least 10 levels difference. And this is just the kind of 'unjustice' I can't live with. Like last time when I was in those area's, this time it pisses me off big-time again. And with the 'good community' Aion has *NOT*, help from higher level players is not really on it's way (as before).